KK Security guards attached to the United States embassy are decrying the lack of payment of their dues by their employer. According to an insider source, Kahawa Tungu understands that over 900 guards working at the embassy are yet to receive payment for work done after official hours as indicated in their contracts. Speaking to KTN on Wednesday the guards said that the security company which was in 2016 acquired by Canadian security firm GardaWorld International owes them at least Sh700,000 to 1 Million in unpaid overtime pay. This is despite Justice James Rika ruling in their favour back in 2012. But the problem our source intimated has been in existence since 1998. In fact, he notes going to court has now proved futile as they read collusion between their employer and those in the courts of law. 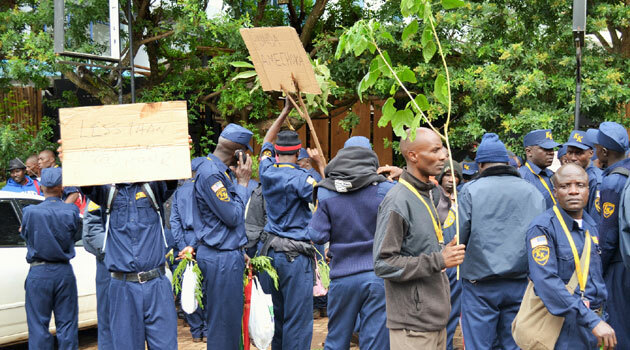 Kahawa Tungu has also learnt that the KK Security management and the US Embassy are plotting to fire at least 500 guards who have been demanding for pay. Our source further notes that at the KK Security offices are guards being issued with suspension letters. In 2017, the same guards downed their tools as they demanded for a pay rise and for the firm’s East Africa Managing Director Nick Arnold to address their grievances. The guards are said to take home a meagre Sh17,000 per month. According to the Diplo Pundit however, the security company was awarded a Sh3.8 billion contract by the embassy on November 23, 2016 to Aegis-KK Security. Then, the employees were demanding that their salaries are increased to Sh38,000 especially due to the high cost of living in the country. In 2013 a former KK Security guard Edward Shabaya filed a case citing wrongful termination of employment, unpaid terminal benefits, arrears and payment in lieu of notice and damages for defamation. At the time of his sacking, the court heard, the plaintiff had 436 outstanding overtime hours and was entitled to Sh130 per hour as overtime pay. He was awarded an equivalent of 10 months gross wages amounting to Sh135,300 and Sh56,680 as unpaid overtime.